Cinco De Mayo Fiesta/Art Show! Click image below to purchase tickets! David Armendariz, talented stylist and owner of Studio A Salon, will host one of his salon's widely popular signature events on May 5. A retired ballet dancer, Armendariz will honor his Mexican heritage and his love of dance with a festive Cinco De Mayo fiesta. All proceeds from the event will benefit All Our Hearts Ministry, a Houston 501(c)(3) non-profit near and dear to his heart. The Muse Emporium, under the direction of Renee Cosette Pedersen and Jonathan Stein, is a creative art consulting firm specializing in exclusive one of a kind Pop Up Art Show Experiences that dazzle the eye and connect the dots between Art, Fashion, Charity and Fun. The Muse Emporium is deeply committed to showcasing artists on the rise and distinction while doing everything possible to raise much needed funds for worthy charities locally and beyond. We're honored to celebrate 5 de Mayo with Studio A Salon in a joint effort to raise money go All Our Hearts Charity and recognize the mesmerizing works of Oxacan based artist, Jorge Pinzón Casasbuenas. Casabuenas will showcase his latest series of paintings which explore the simple joys and tragic plight of children through out history and the impact it has on our culture today. All works will be sold to help, All Our Hearts Ministry commitment to improving the lives of impoverished children in Oaxaca as well as provide urgent treatment and preventative medical care for all individuals in need. * 10% of all art sales will go towards All Our Hearts charity. Studio A Salon's Second Annual Cinco De Mayo Celebration will feature alfresco dining and entertainment on the patio at the chic boutique salon. 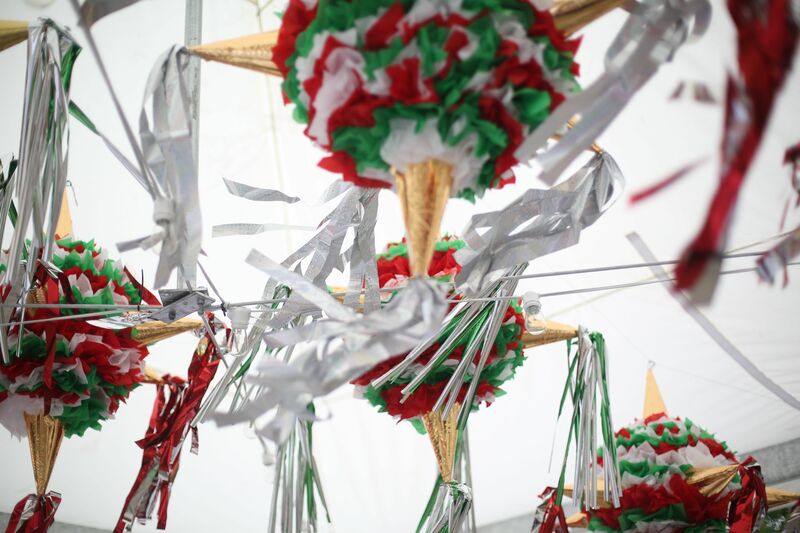 Partygoers will mingle under a party tent colorfully decorated with piñatas and shimmering streamers. A DJ will spin lively tunes while guests enjoy flowing margaritas, an assortment of Mexican beers, tasty empanadas, taco truck fare by Tacos El Ranchero. Stunning models wearing wildly colorful locks and bright makeup looks created by Studio A Salon will be informally modeling and selling raffle tickets to the crowd. Highlights of the evening will be an art auction, musical dance performance by Sin Fronteras Ballet Folklorico a group in which Armendariz is a member. Lucky guests will take home goodie bags filled with fabulous product samples. Studio A Salon, 2411 Sunset Blvd, Houston, Texas 77005. A $25 suggested donation at the door on May 5 will benefit All Our Hearts Ministry. All Our Hearts Ministry is a Christian based 501 (c)(3) which provides urgent treatment and preventative medical care for those in need in third world countries. For more information visit www.allourhearts.org. Referred to as “Houston’s color wizard,” by Allure magazine Studio A Salon owner, David Armendariz, and his team create a VIP experience for their wide range of clients. The ultimate boutique salon, nestled in the heart of West University specializes in Balayage, Inoa (ammonia-free color), precision haircutting, Hotheads Seamless Hair Extensions and make-up for all occasions. Armendariz is happy to provide expert interviews, client photos and makeup/hair styling for live models for your upcoming summer beauty/style features. For more information please visit www.studioahouston.com or call 713.859.1591. RSVP for the party to Alist@StudioAHouston.com.